Have you ever experienced a pounding sensation in your forehead which then gradually extends to the other parts of the head? If yes, then probably it’s a migraine that is bothering you. Migraine causes a person acute misery and discomfort. It is often accompanied by nausea, tingling and in some cases it is even followed by bouts of vomiting. Only the person affected with migraine knows how painful it can be. At such times, one simply wishes to end the misery. Today people are increasingly veering towards home based remedies wherein not only the ingredients are easily available but also the chances of side effects are minimized. Moreover at times, it becomes difficult for a person to get access to medication. 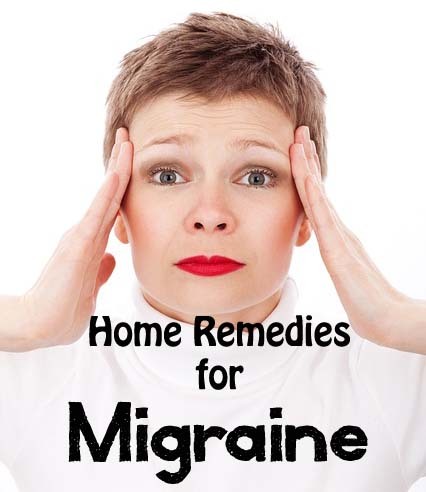 It is therefore necessary that one has the requisite knowledge about certain alternative remedies which can easily be put together at home and administered to a person suffering from migraine. Tea tree oil, an essential oil has been proven to be effective against migraine. Take some oil in your hand and rub it gently into your forehead and temples, putting special emphasis on the muscles. The anti-inflammatory nature of tea tree oil will reduce the inflammation and pain. Repeat this process as many times as you wish. Lack of water in the body and dehydration, in large parts contributes to migraine. Therefore keep yourself regularly hydrated by taking plenty of water and juices to prevent the recurrence of a migraine. If a simple step such as taking water is sufficient to ward off a migraine attack, then why not go for it. Caffeine is in reality a two edged sword. Excessive use of caffeine products can lead to severe headaches whilst at the same time, it is seen that by taking a strongly brewed cup of coffee can in actuality reduce the effects of a migraine. Drinking tea can also reduce the effects of a migraine. A nice strong cup of tea feels very relaxing to a tired and irritated body. Chamomile tea has a proven track record against migraine. Take vitamin B2 capsules every day to prevent a migraine coming on. A shortage of this vitamin in the body can trigger a migraine. To be on the safer side, take vitamin B2 daily. Some people might face frequent urination problems but the dosage can be adjusted accordingly. Lavender oil has great potential to tackle a migraine. The oil vapors are very good in driving away a migraine. Add about 4-5 drops of lavender oil to hot water and inhale the steam. Inhaling this steam will definitely diminish your pain. You can also apply lavender oil directly to the forehead or temples. A hot shower is ideal to attack a migraine head on. If you feel a migraine coming on, go into the shower and take a hot bath. Stand under the shower and let the hot water seep into your neck. Hot water acts as a relaxant on the stressed out neck muscles. The more you stay in the shower, the more you feel relaxed and de-stressed. If you are on the lookout for instant relief from a migraine, simply head to the shower. Another effective remedy which you can try is to take a hydrogen peroxide bath. Fill up your bathtub with water and add hydrogen peroxide to it. Hydrogen peroxide acts as a great detox agent. Not only does your body detox itself, but the headache magically disappears under the becalming influence of hydrogen peroxide. Soak yourself up in the healing waters and see for yourself its wondrous powers. Steep a piece of cloth in vinegar solution. Press this piece of cloth to that portion of your head where you are experiencing the maximum pain. Keep it for about 30 minutes or so as to allow the vinegar to penetrate your skin. You will begin to feel better after some time. Dandelion root is known to provide relief from migraine. Mix about half a teaspoon of dandelion root powder to water. Next add a few sticks of cinnamon and bring it to a boil. Simmer it for a while. Add some honey to add some sweetness to it. Regularly drinking one cup daily will provide respite from those splitting headaches. Peppermint leaves contain essential oils which have been used since centuries for culinary as well as medicinal purposes. The active ingredient in peppermint is menthol which fights well against nausea, headache, toothache and other problems. It is available in the form of capsules or in the form of oil. Break opena capsule and apply it to the temple area. Take some peppermint oil in your hands and gently rub it into your forehead. Due to its anti-inflammatory nature, you will surely experience relief after a while. Ayurveda prescribes ginger for many ailments. Ginger plays an important role in traditional Chinese medicine too. Ginger is well known for its anti-bacterial, antifungal and anti-inflammatory properties. Many people resort to ginger when faced with a headache. Ginger tea, ginger supplements, ginger root can all be taken to minimize a headache. Take a piece of ginger, cut it into slices and add it to boiling water. Boil it for a few minutes. Sip on this liquid to get relief from the pain. Did you know that the ordinary coriander seed, used primarily in Indian cooking, has also the ability to stave off a migraine. Ancient ayurvedic texts have documented this fact. Simply take a fistful of coriander seeds and pour hot water over it. Now inhale the steam. The vaporous steam is believed to reduce inflammation which could be useful in certain cases of migraine. Alternatively you could chew on some roasted coriander seed or use in some food preparation. Well, this is a very obvious thing, but nonetheless a very important process in the step to recovery. If you have a migraine and are busy with your professional commitments, then you are hardly helping yourself. Take a day off from work, dim the lights, put on some soothing music and gently fall asleep. You will definitely wake up refreshed and feeling a lot better. When you feel a migraine coming on, don’t jump the gun and rush to a doctor. You could bank on these innumerable remedies to drive away a migraine and prevent its occurrence.